* Candidate for Miami Beach Commission, Michael Gongora, described his qualifications. Gongora is an attorney, a former commissioner, and a former candidate for mayor. * When asked if illegal short term renting was taking place in their condo building, 75% of membership raised their hand. Methods to stop illegal short term rentals and collecting evidence was discussed. – Report the rental for illegal homesteading to Dade county tax assessor (786) 331-5321. – Post a sign in your lobby stating that short term renting is illegal in your building. – Confront renter, ask them to post a low rating on STR website, in the comment section state that it is illegal. Commissioner Michael Grieco put on his attorney hat and answered several questions from the membership. He stated that per state law, the maximum penalty a condominium can impose for any refraction is $100 a day not to exceed $1,000 a month. However, the city imposes their own violation fines which are up to $20,000. * The owner of Box Coffee introduced his neighborhood coffee shop. With experience in the beer brewing industry, Box Coffee has developed a unique cold brewing process that they would like to bring to South Beach. Owner, Lucas, seeks Wavna approval to replace the front wall of 1657 West Ave with a garage door. * A height increase is being proposed on West Ave and Alton Rd; 5 feet in zone RM-1, 15 feet in zone RM-2, and 10 feet in the commercial zone along Alton Rd. Note, last year the city commission approved a 10 feet height increase on Alton so this would be another 10 feet. 95% of the membership, by a show of hands, opposed any height increase. Wavna will invite the sponsor of the ordinance to explain their position. * There was an update about the Hostel Ordinance. A suite-hotel is an apartment buildings that converts into a hostel. 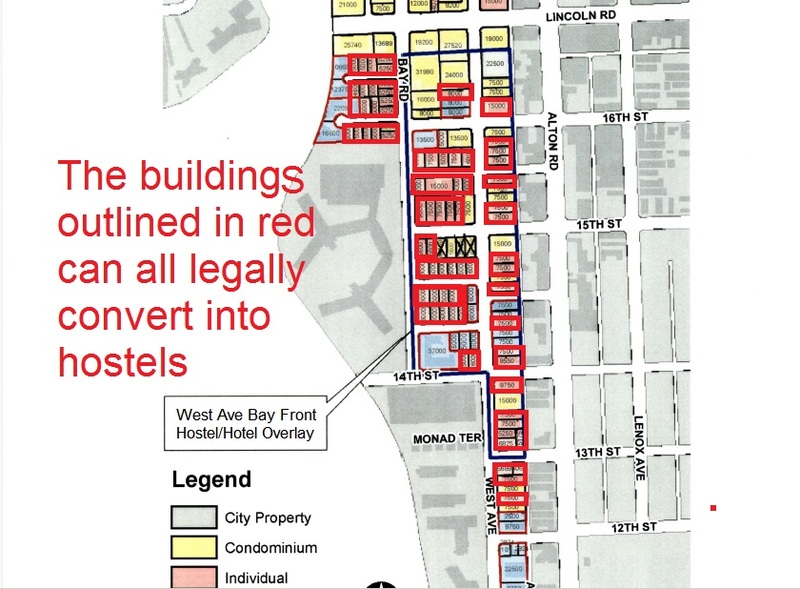 There does not seems to be enough commissioners to support a prohibition of suite-hotels, therefore, an ordinance to instead limit occupancy is being proposed; maximum 8 persons per unit. * Wavna board director, Shawn Bryant described the success of the added trash cans and improved traffic control at Flamingo entrance. Membership agreed that the Flamingo gates need to remain permanently open to allow cars to line up inside the property. A member requested that trash cans at bus stops be adjusted so she can see the bus arriving. *A request for volunteers to help Wavna in various capacities was made. Update, after the meeting six persons contacted Wavna to volunteer their time. This entry was posted in Uncategorized on April 14, 2017 by wavna305.